Nancy Hassinger paid a visit to an injured veteran of the retail wars. "I don't know why — I just really like this store," said Hassinger, Maplewood, as she emerged from the last Rainbow Foods store in Minnesota. The Rainbow Foods chain was once the second-largest in the metro area. But in 2014 the parent company pulled out of the market, and today the surviving Rainbow stands alone along the retail corridor that is White Bear Avenue. "I really don't know what it's doing here," said Jaymeece Thompson, Maplewood, as she put groceries from the store into her car recently. "You can tell this is the last one. I am surprised it's even open." Rainbow was founded in 1983 by entrepreneurs Sid Applebaum and D.B. Reinhart, the St. Paul Pioneer Press reported. The chain was sold to Fleming Foods in 1994 and Roundy's in 2003. The first sign of Rainbow's troubles came when parent company Roundy's yanked the stores from the market. The Milwaukee company's bosses cited the recession and increased competition for the chain's struggles. In 2014, Roundy's quickly sold 18 locations, and shopped around the remaining nine. Most of new owners put their own names on the former Rainbow stores. Others were eventually closed down. The Rainbow in the Midway area of St. Paul was shuttered in September to make room for a new soccer stadium. Jerry's Foods, with stores in Woodbury and Edina, bought the Rainbow in Richfield and shut it down March 16. That left only the Maplewood store. Located north of Minnesota 36 at White Bear and Gervais avenues, the store is clean and well-maintained, inside and out, and the shelves are well-stocked. But compared to the Cub Foods one block away, it's not easy to see why it's still in business. The Cub's total floor space appeared to be twice as big, and the produce section of the Rainbow was half the size of Cub's. 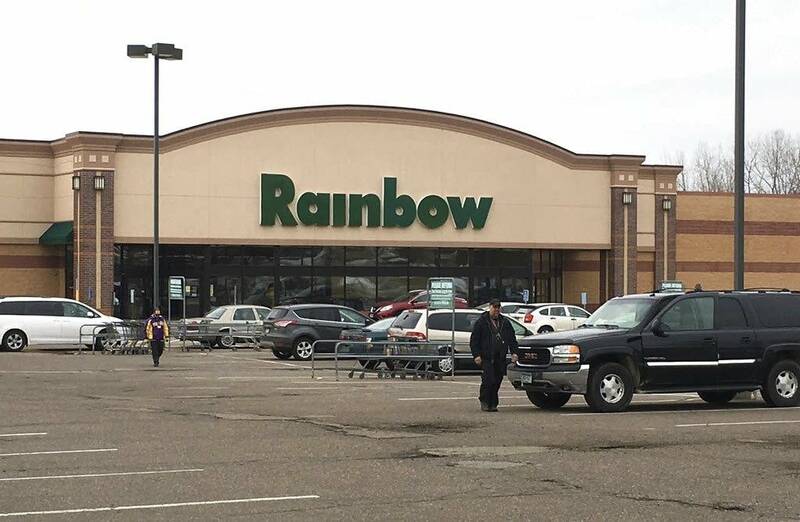 But Rainbow survives for one reason — it was purchased by the owner of Cub Foods. The Rainbow can be described as Cub Light. Shoppers can't miss the crossovers -- Rainbow carries the Cub store brand, Essentials. In the checkout lanes, it accepts the Cub Rewards cards. A company spokesman said Cub supplies the food in the Rainbow store. Many locals theorize that Cub Foods may have bought the Rainbow to prevent a competing chain from moving in. Cub is fighting off intense competition from Hy-Vee Supermarkets, which has recently built stores near several Cub locations. The company spokesman did not respond to emailed questions about why Cub bought the Rainbow store. While Thompson, the Maplewood shopper, finds the Rainbow store lacking ("They don't have anything here,") Hassinger sings the praises to her favorite store. "This store has been here 30-some years," she said. "They are always friendly. I hope it stays here."